This sections contains overview and links to documentation of previous version ESP32 Modules and Boards that have been replaced with newer versions or discontinued. It is maintained for convenience of users as several of these boards are still in use and some may still be available for purchase. 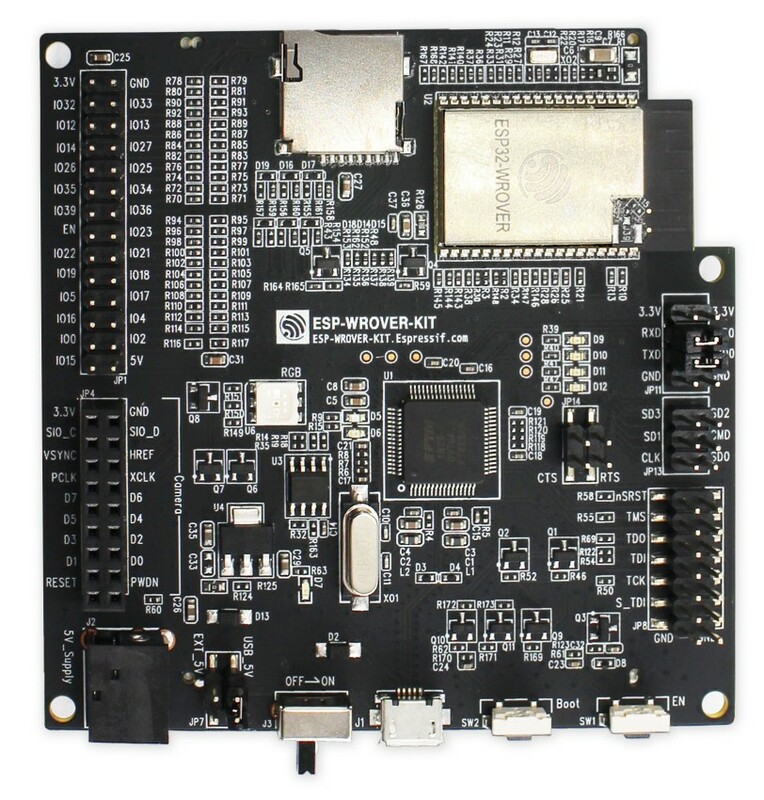 To see the latest development boards, please refer to section ESP32 Modules and Boards. Comparing to ESP32-PICO-KIT V3, this version has revised printout and reduced number of exposed pins. Instead of 20, only 17 header pins are populated, so V4 can fit into a mini breadboard. 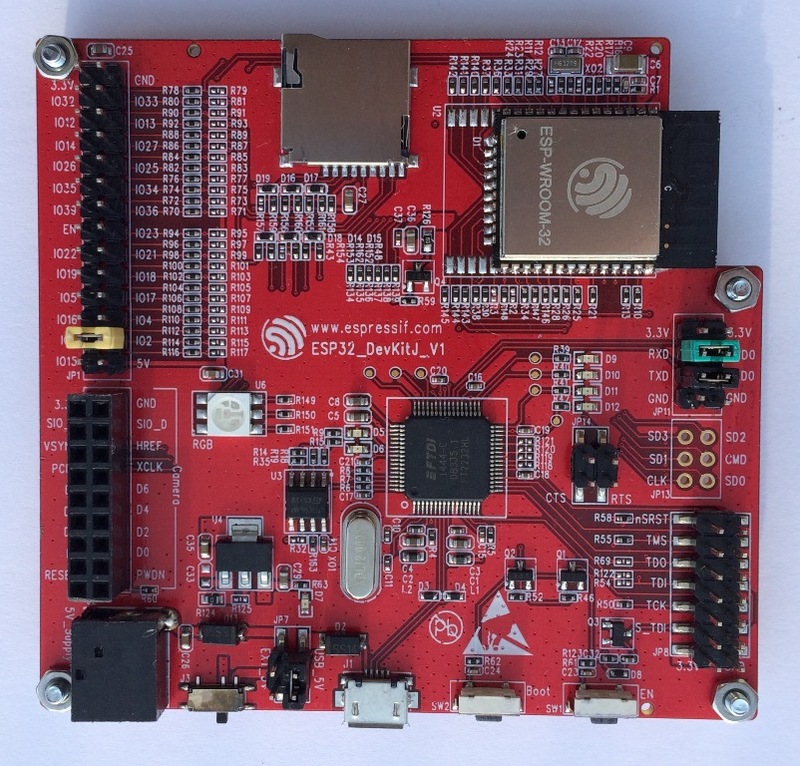 The first public release of Espressif’s ESP32-PICO-D4 module on a mini development board. The board has a USB port for programming and debugging and two rows of 20 pin headers to plug into a breadboard. The ESP32-PICO-D4 module itself is small and requires only a few external components. Besides two core CPUs it integrates 4MB flash memory, a crystal oscillator and antenna matching components in one single 7 x 7 mm package. As a result the module and all the components making the complete development board fit into 20 x 52 mm PCB. Small and convenient development board with ESP-WROOM-32 module installed, break out pin headers and minimum additional components. 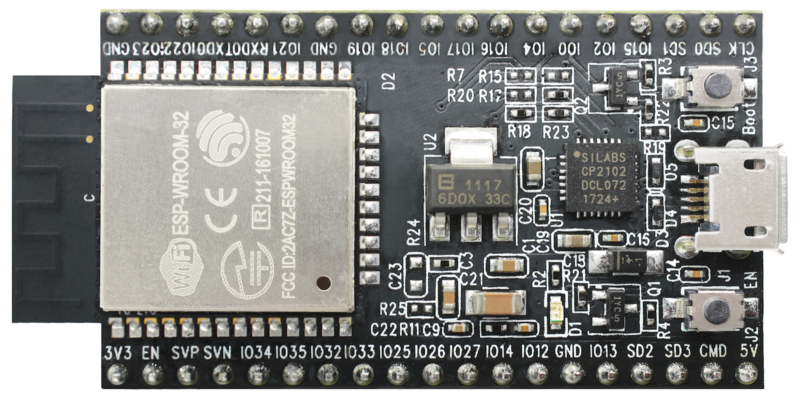 Includes USB to serial programming interface, that also provides power supply for the board. Has pushbuttons to reset the board and put it in upload mode. The ESP-WROVER-KIT V3 development board has dual port USB to serial converter for programming and JTAG interface for debugging. Power supply is provided by USB interface or from standard 5 mm power supply jack. Power supply selection is done with a jumper and may be put on/off with a separate switch. This board has MicroSD card slot, 3.2” SPI LCD screen and dedicated header to connect a camera. It provides RGB diode for diagnostics. Includes 32.768 kHz XTAL for internal RTC to operate it in low power modes. 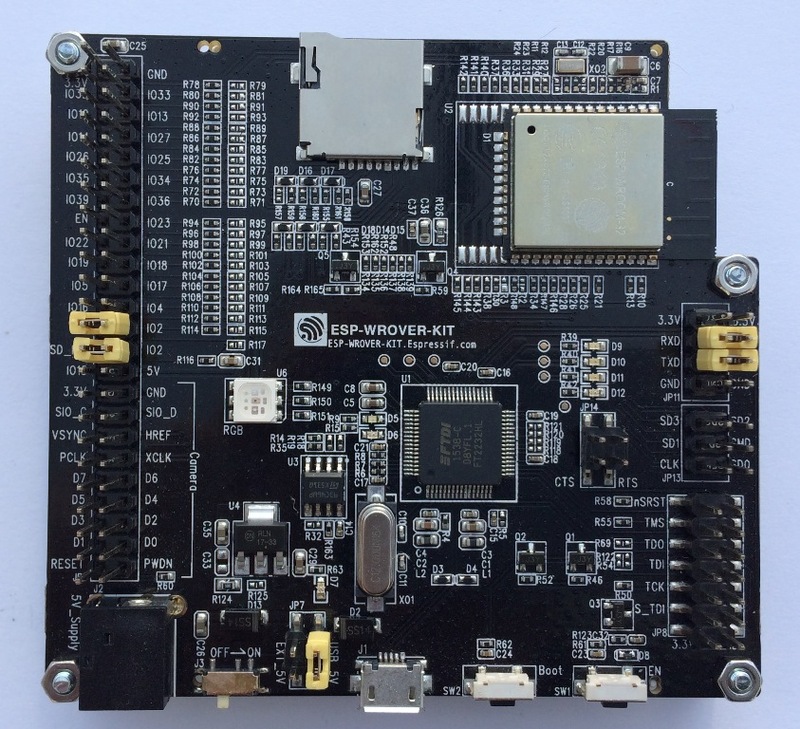 As all previous versions of ESP-WROVER-KIT boards, it is ready to accommodate an ESP32-WROOM-32 or ESP32-WROVER module. This is the first release of ESP-WROVER-KIT shipped with ESP32-WROVER module installed by default. This release also introduced several design changes to conditioning and interlocking of signals to the bootstrapping pins. Also, a zero Ohm resistor (R166) has been added between WROVER/WROOM module and VDD33 net, which can be desoldered, or replaced with a shunt resistor, for current measurement. This is intended to facilitate power consumption analysis in various operation modes of ESP32. Refer to schematic - the changes are enclosed in green border. The camera header has been changed from male back to female. The board soldermask is matte black. The board on picture above has ESP32-WROVER is installed. This is updated version of ESP32 DevKitJ V1 described above with design improvements identified when DevKitJ was in use, e.g. improved support for SD card. By default board has ESP-WROOM-32 module installed. Comparing to previous version, this board has a shiny black finish and a male camera header. 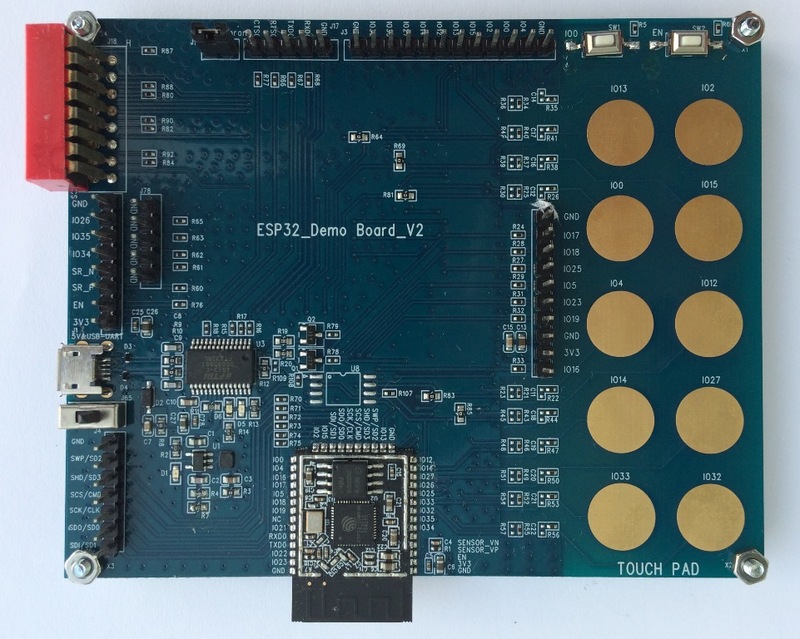 The first version of ESP-WROVER-KIT development board. Shipped with ESP-WROOM-32 on board. ESP-WROVER-KIT has dual port USB to serial converter for programming and JTAG interface for debugging. Power supply is provided by USB interface or from standard 5 mm power supply jack. Power supply selection is done with a jumper and may be put on/off with a separate switch. The board has MicroSD card slot, 3.2” SPI LCD screen and dedicated header to connect a camera. It provides RGB diode for diagnostics. Includes 32.768 kHz XTAL for internal RTC to operate it in low power modes. All versions of ESP-WROVER-KIT are ready to accommodate an ESP-WROOM-32 or ESP32-WROVER module. The board has red soldermask. One of first feature rich evaluation boards that contains several pin headers, dip switches, USB to serial programming interface, reset and boot mode press buttons, power switch, 10 touch pads and separate header to connect LCD screen. Production of this board is discontinued.